The best time to see a Golden Bowerbird is in the wetter months from November to January. This is when males are active building bowers and females are nesting. Some Golden Bowerbirds have lived until they are 25 years old  an impressive age for their small size. The mature male is a golden-olive brown colour, with golden yellow underparts, crown and nape. He has an unusual feather structure that refracts light to produce pure white highlights on the plumage. When younger, the male looks the same as the female. Both have a golden iris. The female, less conspicuous than the male, is olive-brown with ash-grey below. 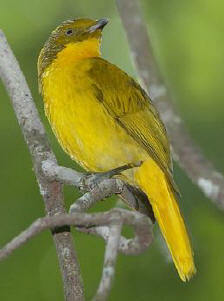 The Golden Bowerbird is one of 12 bird species endemic to the Wet Tropics region. It can be seen in Queensland in rainforests from just south of Cooktown to Paluma, generally at altitudes between 900 and 1500m, but sometimes as low as 700m. The bower is usually about two metres tall and constructed around two trunks of saplings connected loosely by a fallen branch. It uses lichen and freshly-plucked flowers to decorate it. It is the worlds smallest bowerbird, but it is able to build the largest of all bowers. The bower represents external symbols of an individual males fitness. The male Golden Bowerbird builds a maypole type of bower of one or two towers of sticks up to 3m tall with a display perch. Skilfully laid sticks connect the towers and decorations are placed on them. These are often white, off-white and pale green orchids, jasmine, other flowers, seedpods and lichens. The sticks become glued together by the action of fungi after some time. To maximise the time a male can spend at a bower, he hides fruits in different places throughout the bower. The bower is very important to the bird, and rival males may steal higher valued decorations from each others bowers. This is because the females are discriminative  they will only select the male who uses ornaments that are the rarest or hardest to obtain. The average life of a bower structure is 9 ½ years, and the same sites are often used from generation to generation, perhaps for 60 years. Males in adult plumage may occupy a traditional bower site. The male birds will not start to gain signs of adult plumage until they are at least 5 years old. The average period of ownership in a study of 46 bowers was 7 years. Some sites have been occupied by a succession of males for several decades. The male tries to fertilise as many females as possible during each breeding season. The females assess the males vocals, plumage, displays and bower structure before selecting and mating. The female raises the one or two young in a small cup nest in a tree crevice. The Golden Bowerbird eats fruit most of the time, but also beetles and cicadas. Its voice croaks and mimics. In the Wet Tropics, it has been discovered that golden bowerbirds inhabiting mountain tops just 20km from each other sing quite different songs. In fact, although the birds behaved aggressively when played tapes of local golden bowerbirds, they did not respond to the songs of birds from other areas.